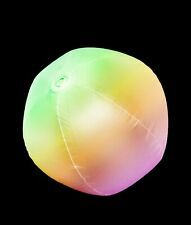 Keep the pool party going well after the sun goes down with this flashing beach ball. Ball is ready to go once you open it it. Just simply blow it up then turn it on. It will flash for about 4-6hours. Color:Blue Aged Bronze. Type: Occasional Chair. Material:Fabric Iron. Sculpted seating upholstered in a soft to the touch navy with exposed U shape legs for a dramatic touch that looks good from any angle. Sultry and sensible. Performance grade upholstery of textural blue hugs the curves of modern minded seating with a hidden swivel for a functional touch. Type: Occasional Chair. Features:Hidden Swivel Base Performance Grade Upholstery. Material:Old Teak Wood. Color:Distressed Blue. Nothing is Set in Stone! Style: Modern. Nothing is Set in Stone! Color: Petrol Black. Color: Teal Croc. From cow to crocodile. Upholstery Fabric: Top Grain Leather. Material: Top Grain Leather. Nothing is Set in Stone! Shape: Drum. Color: Blue Croc. From cow to crocodile. Upholstery Fabric: Top Grain Leather. Material: Top Grain Leather. Style: Contemporary. Nothing is Set in Stone! Shape: Drum. Style: Modern. Material: Fabric Plastic. Color: Petrol Black. Nothing is Set in Stone! 92" One of a Kind Celeste Cabinetchina China. Type: Cabinet. Nothing is Set in Stone! Modern Origins Manufactured by:World Bazaar Exotics. Nothing is Set in Stone! 48" Damiano Dresserchina China. Length: 48" Depth: 20" Height: 36". Bench style seating and turtle shell arms upholstered in a rich indigo with flat angled iron legs for a perfect pairing of style and comfort. Type: Sofa. Color:Indigo Black. Material:Fabric Iron. Upholstery Fabric:Polyester Blend. Classic tulip shaping is recast with a rustic black iron finish. Bistro style perfectly sized for a cozy breakfast nook. Material:Blue Stone Oak Wood Iron. Room:Dining Room. Color:Blue Stone Black. Nothing is Set in Stone! Includes 120V Electric Air Pump and Repair Kit. Extra Wide Air Valve. Made With Durable Materials In Deep Colors The Is The Ideal Accent For Any Space. Room:Living Room. Nothing is Set in Stone! Type: End Table. Color:Black Blue. Features:Hand Finished and Distressed. The Stool is all about sophisticated glam. With a velvety upholstery and caged brass base, this stool is both stylish and functional. Type: Bench. Material: Iron, 100% Polyester Upholstery, MDF, Polyester Filling. BEAUTIFUL BLUE TRIANGLE PATTERN MANGO WOOD COTTON STOOL. 23" X 16" X 12"TALL. Material:Hardwood and Iron. Features:3 Sliding Doors. Nothing is Set in Stone! We attended to all the details when we designed this beautiful leather drum table. Note the careful application of nailhead trim along the bottom and top edges. Love the hand-painted dragon. Room: Living Room Bedroom. We special ordered this table in a unique size. Room: Living Room Bedroom. Type: Chairside Lamp Tables. Nothing is Set in Stone! Simple while sophisticated. A clean Parsons style dining table of black washed oak adopts new depth by way of a bluestone inset top and cleverly splayed legs. Type: Dining Table. Material:Blue Stone Oak Wood. This multi color Pouf cover is graced with hand embroidered patchwork and adorned with exquisite Patchwork. The patches are hand embroidered with Patchwork and different varieties of fancy colorful beads. Love this kitchen table. It will serve as a partners desk also with the six drawers and shelf storage. Soft grey finish. Features: 3 Drawers Multiple Shelves. Room: Living Room. Nothing is Set in Stone! The End Table Matches The Natural Beauty Of A Bluestone Top With A Finely Crafted Iron Base. The Bluestone’s White Veining And Dynamic Surface Make Every Table Unique While The Table’s Thin Legs Lend A Delicacy To The Piece. There are an air inlet, a black bung and a leak-proof cap in the airbed to avoid leakage. Fits most car models(Saloon car 、 SUV 、 MVP),Perfectly fit your car. 2 minutes to complete the air cushion bed folding, convenient and practical. Type: Cabinet. Style: Material: Wood. Type: Cabinet. Style: Material: Steel and Linen. Classic tulip shaping is recast with a rustic black iron finish for an industrial look and feminine feel. Type: Dining Table. Room:Dining Room. Material:Blue Stone Oak Wood Iron. Color:Blue Stone Black. Fits 2 cushion loveseat. The color is a blue with a grey undertone and white lattice. Our Blue sideboard is impressive in so many ways. It has six raised panel doors and a solid base. The top is natural pine. Material: Pine. Color: Blue. Nothing is Set in Stone! Style: Modern. Put this friendly looking bench in the kitchen for convenience or as dining seating. By the back door will work too. Nothing is Set in Stone! Love the natural wood tone of Pine showing through the French painted finish. Note the very narrow drawer at the top with three larger drawers underneath. Bun feet in the front and block feet in back. Arm pads are leather. If the car keys fall out of your pocket they won"t be hard to find. Style: Modern. Nothing is Set in Stone! Material: Leather. Type: Leather Chairs. Type: bookcase. The grey and white painted finish accentuate the sculptural lines of this bookcase. The black interior features four removable shelves at the top and one behind the shaped doors. Color: Midnight Blue Walnut. Material: Fabric Wood. Nothing is Set in Stone! Color: Dusty Blue Black. Style: Modern. Pure Aniline top grade cow leather. Material: Leather. Type: Leather Chairs. Type: Sofa. Color: Lagoon Blue Walnut. Style: Modern. Nothing is Set in Stone! What else could you ask for?. Possibly one more. Nothing is Set in Stone! Material: Leather. Type: Leather Chairs.